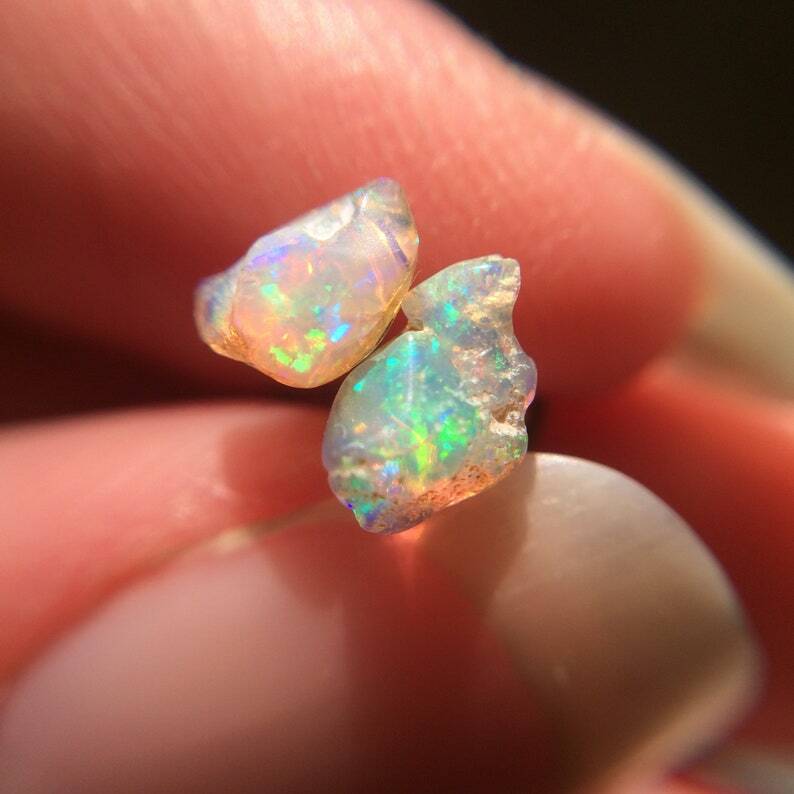 Handmade earrings with two natural raw polished Ethiopian Welo Opals. 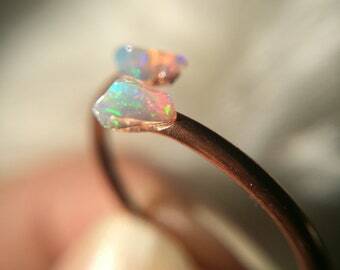 Opals measure 4 to 6 mm each one. 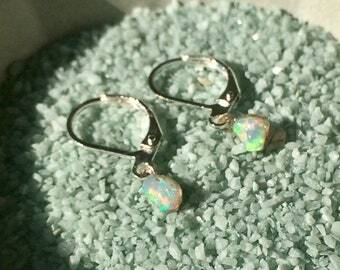 Stainless steel and brass earrings, nickel free! Please remember to remove the earrings before bathing and cleaning. I’ll ship the earrings gift wrapped, in a sturdy cardboard box, for you or your loved one. Please note that I'm not responsible for lost, stolen or damaged items, when they leave my hands. For raw stones jewelry I'll use a special cardboard sturdy box and ribbons. For butterfly jewelry I'll use a handmade cardboard envelope and ribbons. Una piccola opale.. Che si fa notare molto , stupenda e assolutamente brillante, un'idea artistica. Super soddisfatta, grazie. 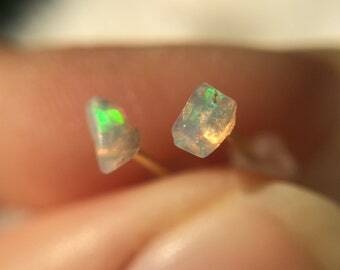 A small opal .. Which is noted very, wonderful and absolutely brilliant, an artistic idea. Super satisfied, thanks. Assolutamente unici e.. Arte pura, opali molto luminose arricchite da una mano esperte. Molto belli, sono molto soddisfatta, grazie! Absolutely unique and .. Pure art, very bright opals enriched by an expert hand. Very beautiful, I am very satisfied, thanks! In rame o argento sono dei pezzi splendidi, unici nel loro stile, da indossare sempre e.. Ammirare! Veramente contenta! In copper or silver they are splendid pieces, unique in their style, to be always worn and .. To admire! Really happy! All my items are made to order and take a lot of time to be created. 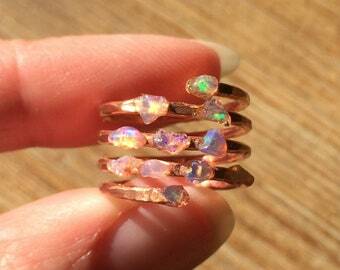 I'm a small artisan and I'm not able to issue refunds if you should change your mind after purchase (buyer's remorse). Returns are not accepted for custom orders. Your orders will fly to you with Registered Airmail by Poste Italiane, that is fully trackable with tracking number, in almost any countries of the world (except to Canada and Australia, in my experience). Delivery time: Europe 7/9 working days, U.S.A. 10/12 working days, Canada 14/18 working days, Rest of the World 18/22 working days. During holiday periods, such as Christmas, delivery times will be slower, due to the intense traffic in international shipping. Shipping charges listed reflect actual costs. Unfortunately the Italian postal service (Poste Italiane) is a little bit expensive, but the more you buy, the more you save in shipping charges. If you are interested in Insured Airmail, or other ways, please convo me before to pay the order! Please note that I'm not responsible for any damage or loss of shipments. Custom and wholesale orders are welcome! Please convo me for more informations!